If your husband came home and told you he picked something up from the side of the road, what would your reaction be? 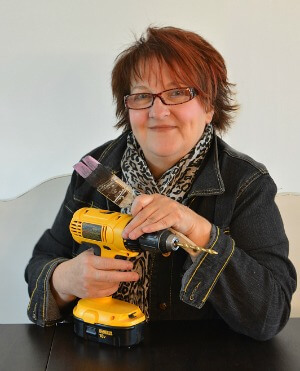 If you're a junk loving upcycling gal like me, it would be music to your ears. 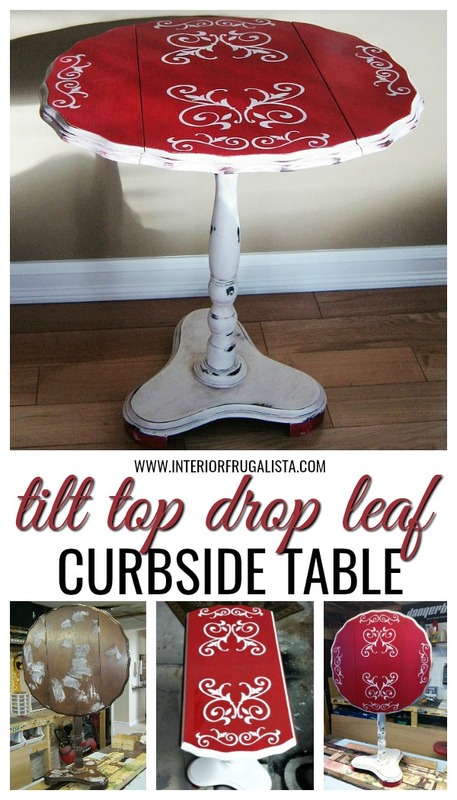 I was jumping for joy when Mr. Frugalista brought this curbside tilt top drop leaf table home - you don't come across these often. Not only did the top tilt but it had drop leaf sides too and I was swooning over the scalloped edge and cloverleaf base. I believe these are considered wine tables and this one is staying with me. This is what the table looked like before - after I started some repairs. After giving the table a good scrub with warm soapy water, I gave it a scrub with a liquid deglosser to remove the glossy finish. Next, I repaired the knicks and scratches with my favorite filler. 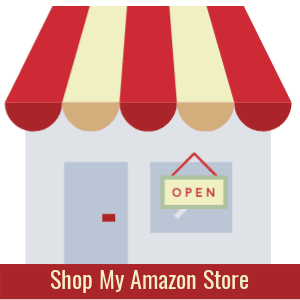 You can find those products here in The Interior Frugalista Shop on Amazon. 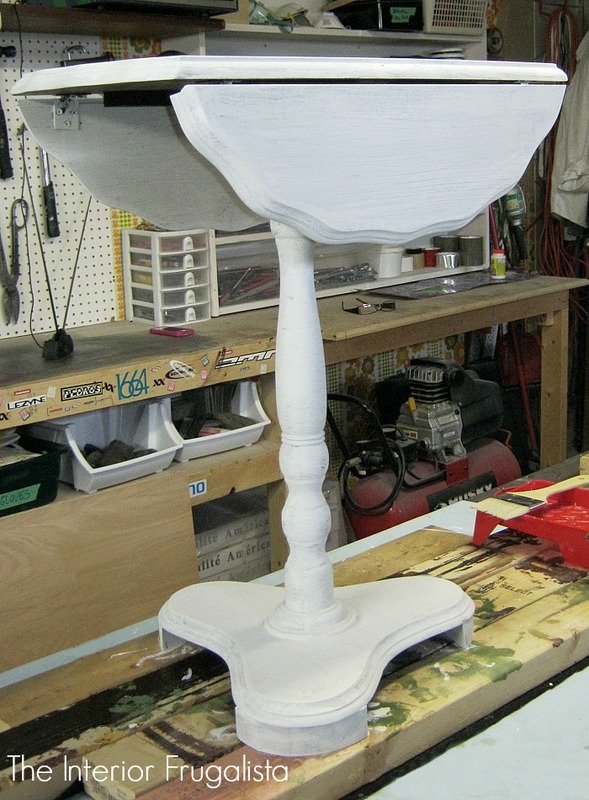 For the base coat, I painted the entire table with two coats of Annie Sloan Chalk Paint in the color pure white. 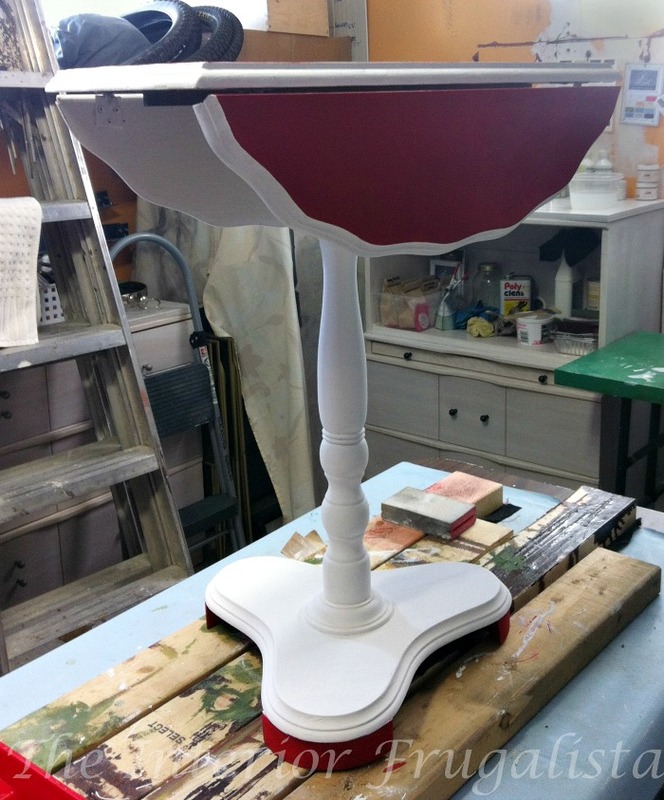 Once the white was completely dry, I applied two coats of Annie Sloan Chalk Paint in luscious Emperor's Silk on both the top and feet. As often happens midway through a project, I changed my mind and decided to emphasize the scalloped edge by painting it white. 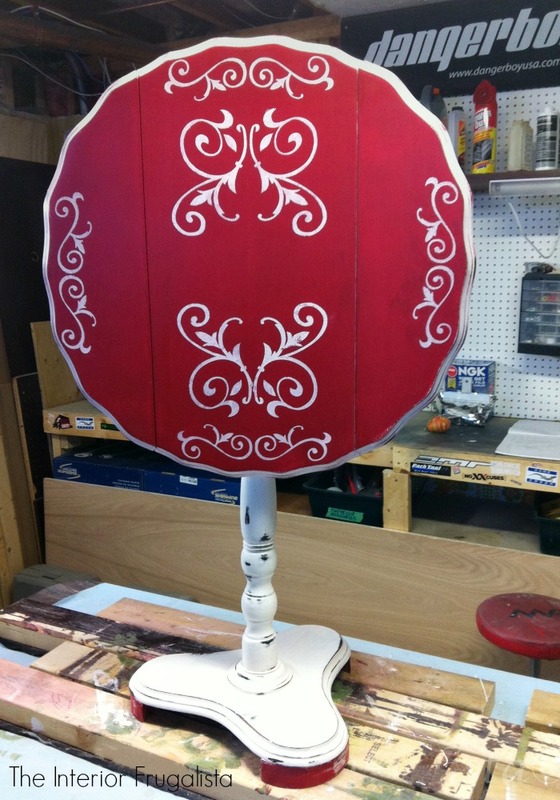 To add detail to the painted red top, I stenciled a damask pattern with the same pure white chalk paint. 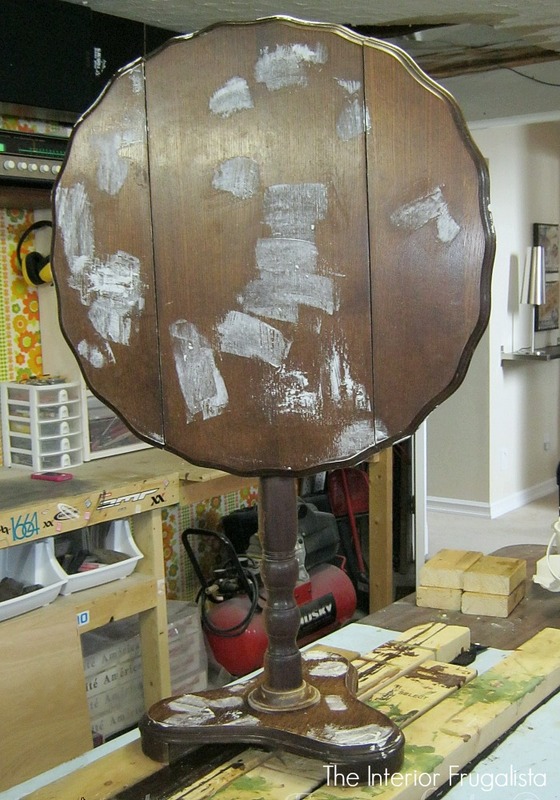 Once the stencils were dry, I lightly distressed the table around the scalloped edges, base, and feet with 180 grit sandpaper to give the table an aged patina. The entire table was protected with Miss Mustard Seed's Beeswax and buffed to a matte finish. To add to the distressed age patina, a light coat of dark wax was applied all over the table and the excess removed with a lint-free rag. The dark wax deepened the color of the pretty red too. I love the versatility of this table. When not in use the top can be tilted and the table set against a wall and out of the way. 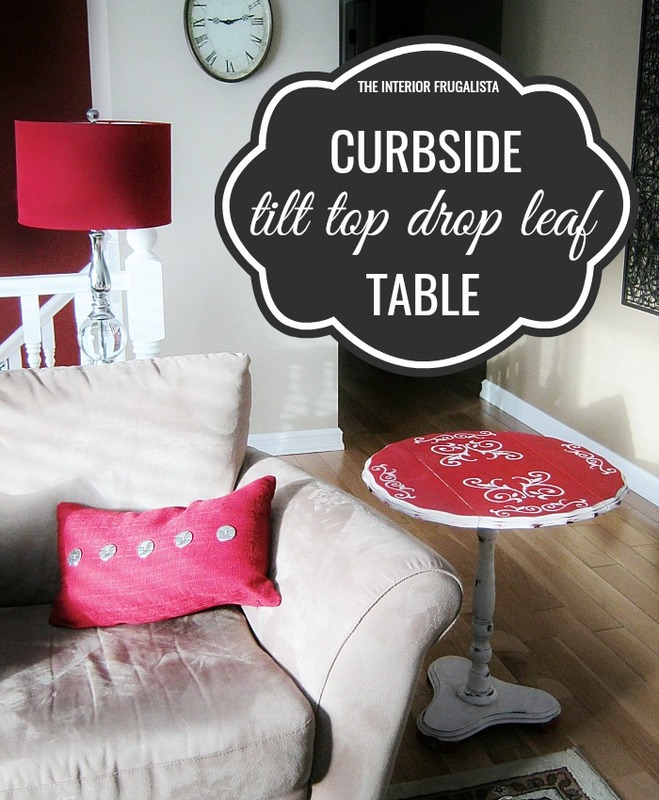 With the drop leaf down, the table fits beside an armchair without taking much room. With one leaf down it becomes a demilune table and is perfect as a small entry or hall table. Fully extended comes in handy when entertaining and placed between two chairs for guests to use for setting drinks and food. 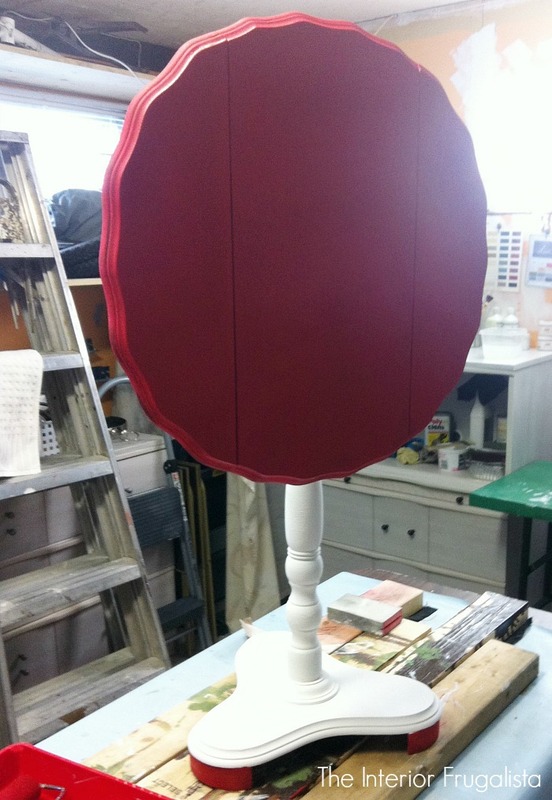 I had the pleasure of finding another scalloped tilt top table with a rectangular top. 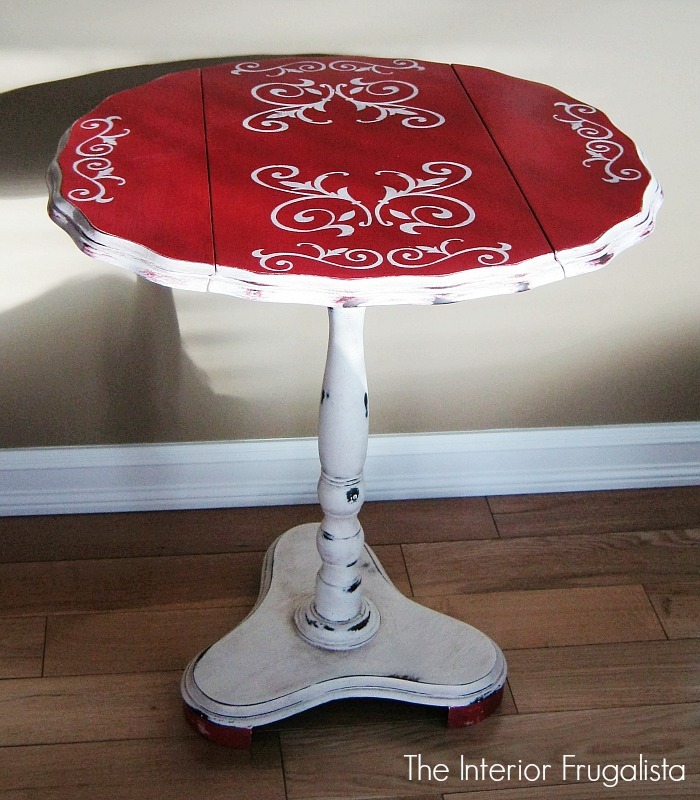 That one has metallic details with a pretty papered top and you can find it here in my post, Antique Tilt Top Tea Table. 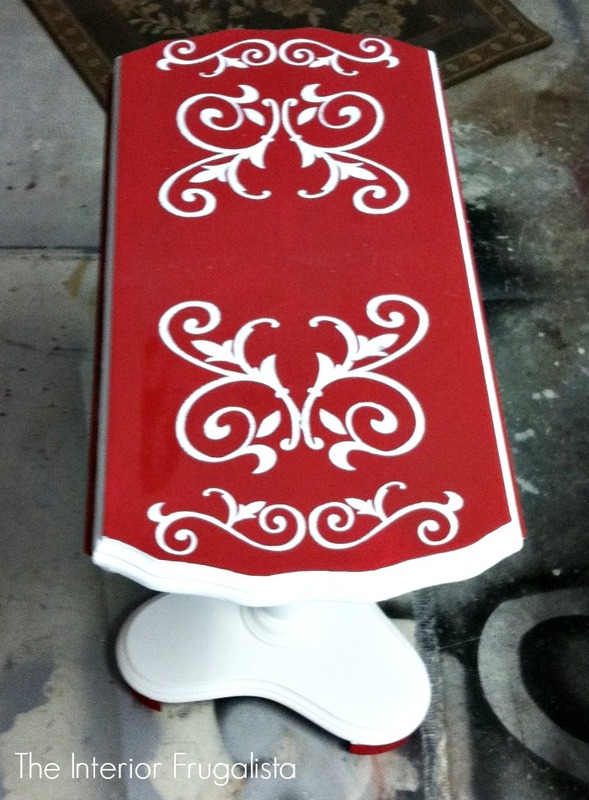 UPDATE: I must admit I did tire of the damask stencil after a few years but not the bold red top. 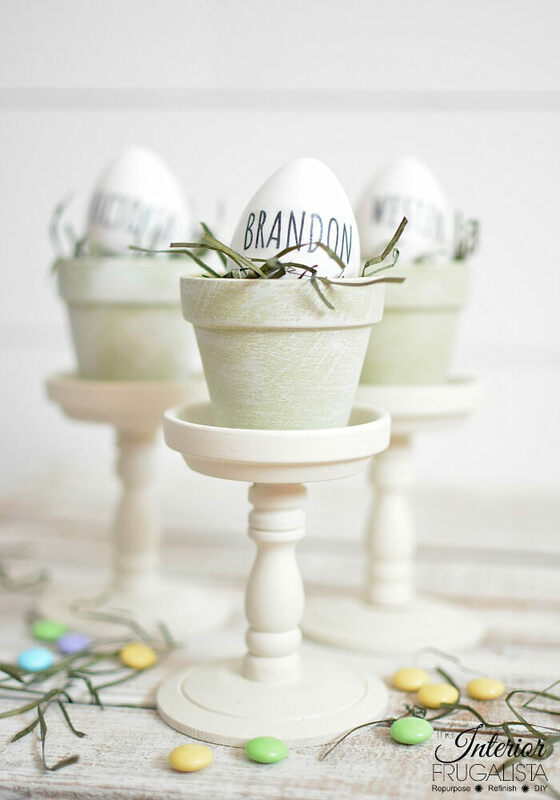 The tilt top table received a second makeover that I absolutely adore and you can see it here in my post Curbside Tilt Top Table AGAIN With Parisian Flair. If you saw this table on the side of the road would you have picked it up? I'm sure glad Mr. Frugalista made that choice because it is one of my favorite tables in our home. Thanks Leanne, that means a lot coming from you! Love it! Red and white are pretty classic. Wouldn't a cute little tea towel with redwork embroidery look sweet with it? Yes it would kbradseth, along with a pretty teacup and saucer. Wish I would have thought of that when taking the After picture!